fairly traditional for heartbreak and tears. 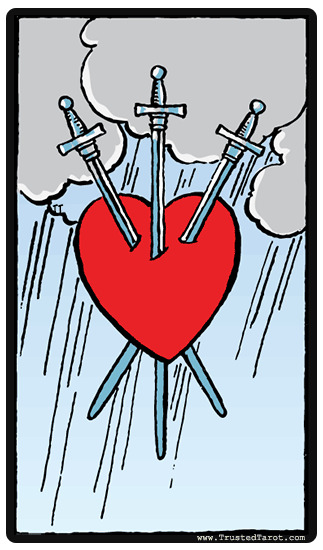 One of the most iconic images in the tarot, the Three of Swords displays a floating heart that is pierced by three swords. Above it, there are heavy clouds. There is also a heavy downpour in the background. The symbolism is pretty opaque, and the emotional effect that it has is immediate. The heart is the seat of warmth, affection and spirit, and the three swords indicate the power to harm, cause pain, and create suffering to what it pierces. This is an image of grief, loss and literally heartbreak. The clouds and rain depict the surrounding grimness of the situation. 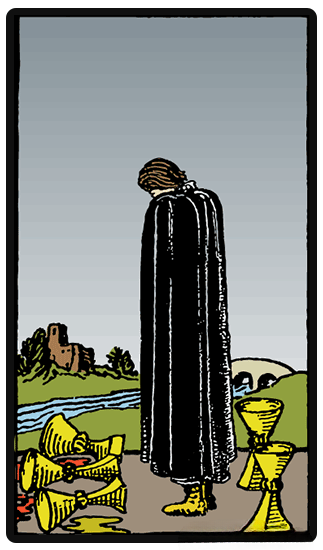 All these symbols point to the Three of Swords showing a low point in one's life. Success achieved slowly, over time.